The CM260 is a fully adjustable pyranometer mounting kit. It has been specifically designed for the limited space near the end cap of the ATI Torque Tube and can be used with any other 12.7 cm (5 in.) diameter tube. The CM260 can be ordered with a standard top plate (same as CM255LS) for use with most common pyranometers or with a top plate designed for the VU01 ventilation unit. Note: ATI is an initialism for Array Technologies, Inc. 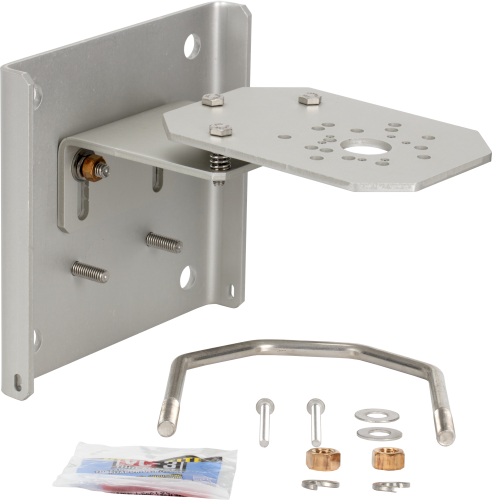 The process of securely mounting and accurately leveling a pyranometer to a mounting bracket has traditionally been very difficult. The balance between tightly securing the sensor to the mounting bracket while perfectly leveling the sensor requires great time, skill, and fortitude. Without a secure fit, the sensor’s position will shift, and the sensor’s level will potentially be lost. The process is made even more difficult when the sensor is to be mounted on a single axis tracker torque tube to enable plane of array measurement. The CM260 is an adjustable-angle mounting stand. The installation technician can now securely bolt the sensor to the mount. Then, using the sensor’s bubble level as a reference, the technician levels the plane of the mount by adjusting the CM260's built-in leveling bolts. The CM260 is compatible with all major brands of pyranometers, and it is compatible with the VU01 ventilation unit from Hukseflux.